The SmartBox is designed to help you search for information. 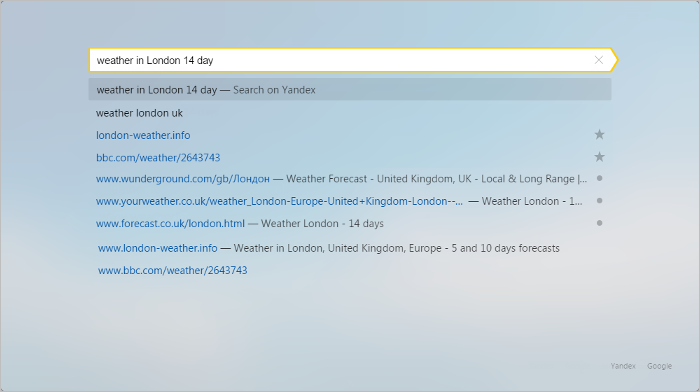 By default, the Yandex search engine is used to search for answers to your query. You can change your search engine if you want to. You can't disable or remove the SmartBox. What do I do if a webpage doesn't open? Enter a search query, address, or name of a website in the SmartBox. Enter the site's name or address in the SmartBox. If the site supports OpenSearch, you will see Press Tab to search [site name] appear on the right. 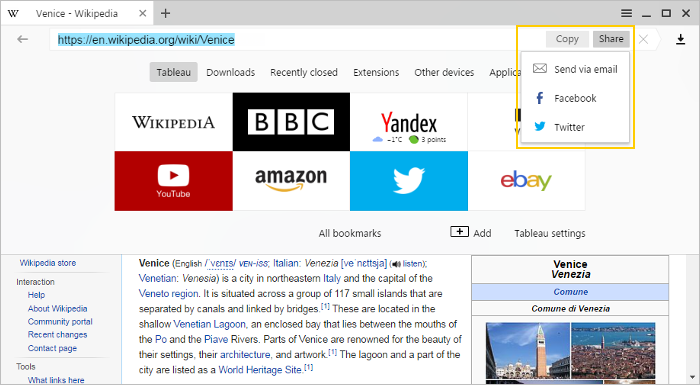 Press the Tab key (you will see the site name appear on an icon in the left part of the SmartBox). To exit OpenSearch, click on the right side of the SmartBox. How can I copy a URL when searching on OpenSearch sites? Select a command from the Copy URL or Show page address context menu. Attention. Your search engine will change in the SmartBox, on the Tableau, and in the context menu. 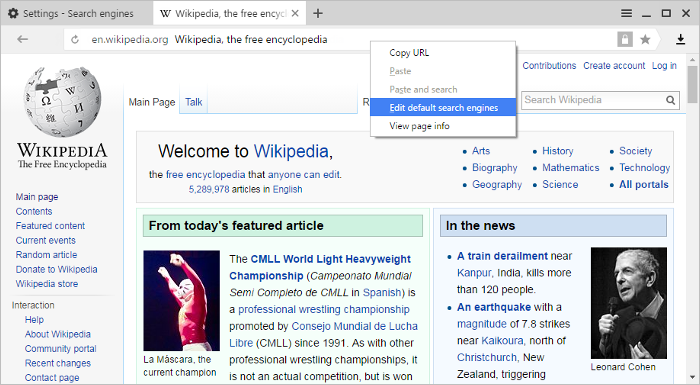 In the context menu, select Edit default search engine. In the Search engines window, position the cursor on the search engine you want and click Make default. 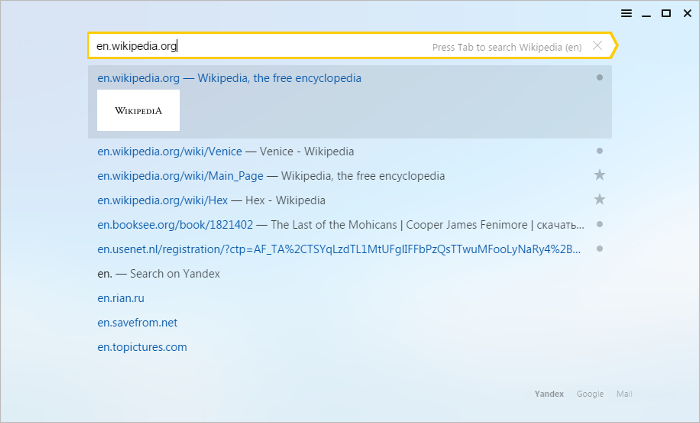 A link with %s in place of query (for example, http://bing.com/?q=%s). Then position your cursor on the search engine you entered and click Make default. Some programs try to change the search engine you use in the SmartBox without your knowledge. Yandex Browser doesn't allow this to happen automatically, and it asks you to confirm the changes (you will need to enter a CAPTCHA). If you don't want to change your search engine, don't confirm the action. To copy a URL to your clipboard, click the Copy button. To share a link with your friends, click the Share button and choose a social network or email address. Turn off the Show “Copy” and “Share” buttons in SmartBox option. 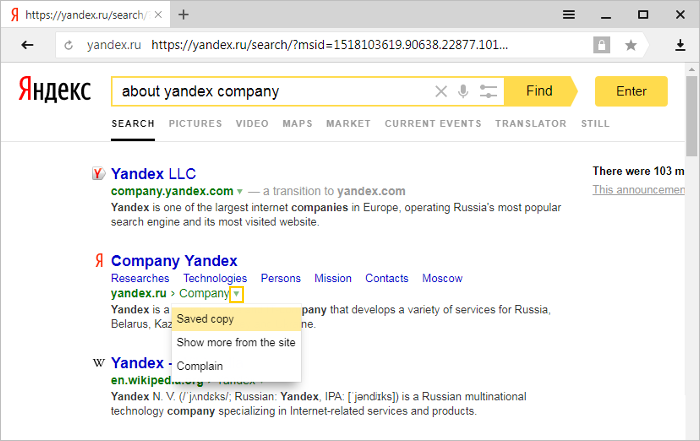 If you entered the page address incorrectly, the browser will give you several links to existing pages with similar addresses, or suggest searching for it in Yandex. If the page was recently deleted, you can view a copy that Yandex cached. 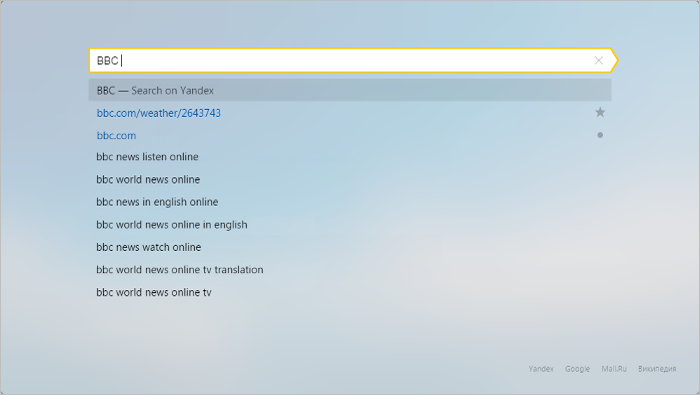 If there were problems on the server side, you can view a cached copy of the page or search for it on Yandex. How do I open a cached website? To see a link to a cached website, click on the arrow next to the site address. Find an answer or go to a websiteSearch sites with OpenSearchChange the search engineCopy or share the page URLWhat do I do if a webpage doesn't open?